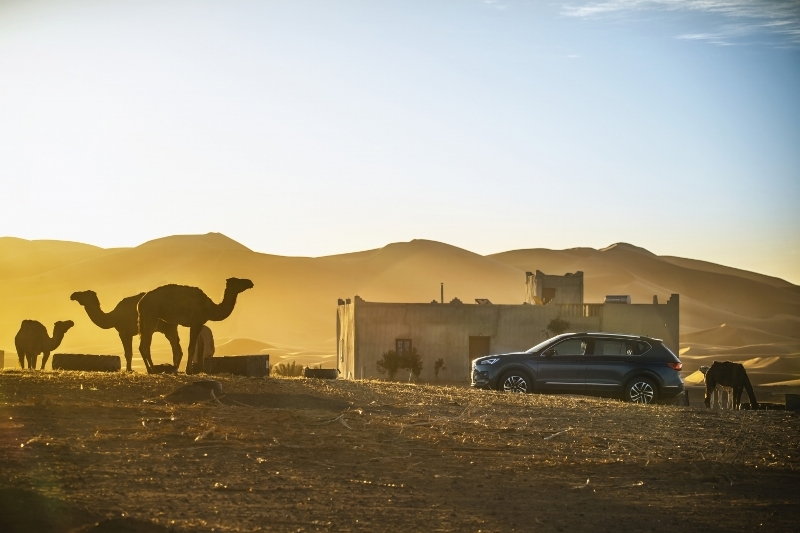 SEAT’s flagship model is being put to the test with the Desert Camp in Morocco…. SEAT’s Desert Camp 2019 – the first event of its kind organised by the company – is taking place in Er Rachidia, Morocco. And what better vehicle to take on the challenge than the Tarraco, giving it, and its drivers the opportunity to put its numerous qualities to the test including its 4Drive technology. Sitting at the top of SEAT’s SUV family, the Tarraco is the bigger brother to both the Ateca and Arona, and mixes state-of-the-art technology, dynamic, agile handling, practicality and functionality with elegant, progressive design. The vehicle’s Dynamic Chassis Control (DCC) system gives the perfect balance between a sporty feeling and a more comfort orientated ride when you need to cover longer distances, on different types of roads. The driver can select which setting they prefer, but the system can also adapt automatically, modifying the ride to suit the road surface and driving style. The Tarraco’s ride quality is matched by the performance and efficiency of its powertrain line-up. All engines benefit from direct-injection, turbocharging and start-stop technology and offer power outputs of between 150PS and 190PS. Two petrol variants are available: a four-cylinder 1.5 litre TSI unit that produces 150PS and is linked to a six-speed manual transmission powering the front wheels, and a 2.0 litre, 190PS offering mated to a seven-speed DSG gearbox and 4Drive total traction system. There are two diesel options, both 2.0 litre TDIs, with power outputs of 150PS and 190PS respectively. The 150PS variant can be connected to either a front-wheel drive, six-speed manual or seven-speed DSG with 4Drive system. The higher-powered version is solely available in 4Drive/seven-speed DSG gearbox. The all-wheel drive technology integrated into certain Tarraco variants gives it the ability to not only improve dynamics on tarmac, but also keep you progressing even when the conditions become tougher. Located on the rear axle, the system sits at the end of the drive shaft, just in front of the rear differential. This gives two benefits: the first is improved weight distribution; the second is a reduction in inertia and system reaction time because the cardan shaft is always connected to the engine. The multi-disc wet clutch features metal friction rings placed in pairs, one in front of the other. One ring of each pair is permanently connected to the drive shaft that turns with the gearbox, the other ring turns with the driveshaft joined to the rear axle’s differential. A hydraulic actuation piston compresses the multi-disc packet to reach the required oil pressure, depending on the parameters indicated by the electronic control system. To make up for small variations in length generated by flexing in the elastic elements that hold both axles, there are two flexible joints at both ends of the drive shaft and a sliding sleeve in the centre. Because there’s need for a pressure accumulator the system is lightweight but benefits from an improved response time, bringing considerable active security and dynamic advantages. SEAT’s on-demand 4Drive technology improves efficiency too. The Tarraco works just like any other front-wheel drive vehicle in normal driving conditions, allowing the drive shaft that sends power to the rear axle to rotate freely, reducing resistance. But should conditions become more challenging the rear axle engages as soon as the system detects the front wheels slipping delivering power instantly to the rear wheels. The advantage of this approach is that it ensures excellent power delivery when it’s needed, but keeps any increase in fuel consumption and emissions to a minimum. When engaged, the intelligent 4Drive system can adjust the driving torque delivered to each axle, equal distribution between the front and rear (50% – 50%) and can even send all the power to the rear axle instantly. As well as this, 4Drive makes torque distribution variations possible between one wheel on one side or the other. The conventional front and rear differentials use an electronic aid, EDS, a simple and light solution that is efficient and safe, and means no transversal torque is lost as the system locks the slipping wheel relative to the opposite side. 4Drive is capable of analysing grip levels, vehicle load, speed, steering wheel position and driving style in real time to deliver power quickly and progressively to the required wheel or wheels, meaning you always have traction, control and responsiveness when it’s most needed. The SEAT Tarraco is also equipped with the progressive steering (standard in Xcellence trim). Compared to a conventional steering system, the progressive steering is based on a progressive steering ratio. In addition to offering a significant angle reduction while maneuvering or parking, the progressive steering offers a much more dynamic response on curvy roads. 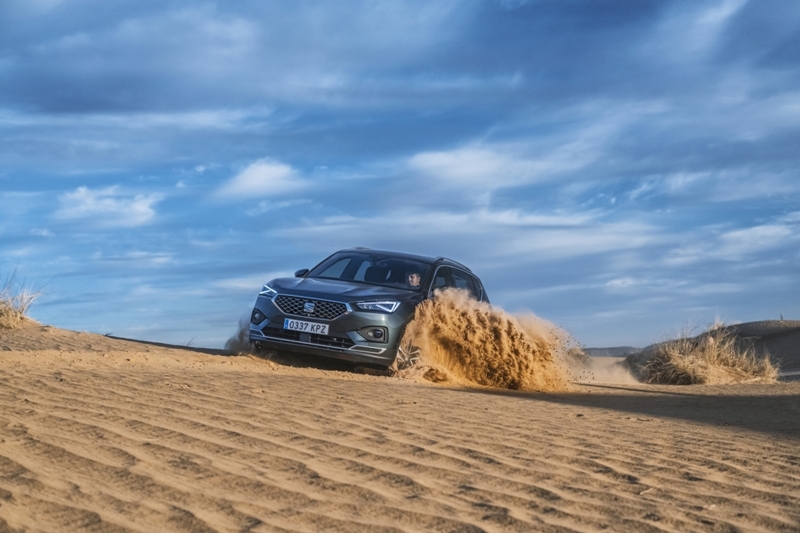 The many and varied landscapes of Morocco and the city of Er Rachidia will put the Tarraco and its 4Drive system to the test, proving what a dynamic and capable vehicle the large SUV is. Not only is the Desert Camp the first time that SEAT has organised such an event, but it takes on even greater significance the lead SEAT has taken within Volkswagen Group as it expands its presence in North Africa. The North African market is one of the key regions in SEAT’s globalisation strategy as the company looks to increase its presence outside of Europe and strengthen its position on all continents. SEAT already has a solid footprint in the region. In 2018, SEAT began assembling the Leon, Arona and Ateca at the Relizane plant in Algeria, joining the Ibiza which has been assembled in this factory since mid 2017. Last year, SEAT sold 18,500 vehicles in Algeria (2017: 5,100) and obtained its best ever sales result in Morocco (2,100; +5.2%).